It is a gift to truly have a passion for your career. Time spent outdoors taking in natures landscapes and how natural elements work together has inspired me. As the owner and founder of Martin Nursery, I strive to consciously create and join elements of our landscape plans naturally. This has been a passion of mine since I established the company in 1992 while earning a degree from Cornell University in Plant Science and Ornamental Horticulture. After graduating, the company progression and development lead us to open our Design Studio and office in Randolph, New Jersey and field production tree farm in East Amwell, New Jersey. 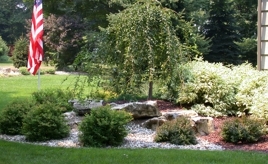 Through experience and education, my company and design process has developed and evolved to be seen as one of the areas most recognized landscape design-build firms. I continue to look forward to interpreting the visions of our clients and transforming their properties into their dream spaces.